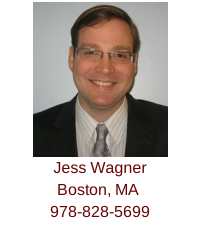 Exclusive Buyer Agent Jess Wagner services Belmont, Massachusett and the surrounding communities. He is available to meet clients in Boston and North of Boston. Jess can be reached using email or by calling his mobile (978-828-5699). Jess helps first-time and experienced home buyers purchase properties in Belmont, MA and other surrounding communities, including Arlington, Medford, Lexington and Melrose. Jess, a licensed real estate broker in Massachusetts, is a member of the National Association of Exclusive Buyer Agents and the Massachusetts Association of Buyer Agents. He also is a member of the Massachusetts Association of REALTORS, North Shore Association of REALTORS and the National Association of REALTORS. Jess completed his undergraduate studies in molecular biology at Skidmore College in 2000. After working as a research scientist for two biotechnology companies, Jess shifted his focus to law, graduating from Suffolk Law School in 2009. Jess is admitted to practice law in the Commonwealth of Massachusetts. A native of Hamilton, Jess now lives Belmont with his wife and two children. Jess can be reached using email or by calling his mobile (978-828-5699). Fill out our home search form to see all the latest home listings in Arlington, MA; Melrose, MA; Belmont, MA; Lexington, MA; Medford, MA; and other Greater Boston Area communities. Client: Ryan & Jennifer B. My wife and I worked with Jess Wagner of Buyers Brokers Only on our house search in the Lexington and Winchester areas. It was a very long process given how hot the market was this Spring , but Jess was patient, informative, available, and calm. We never felt pressured or pulled in any direction, and we felt like he did a really good job of learning who we were and what we valued in a property. He wouldn't swamp us with properties he knew wouldn't work for us: he would just focus on those few listings that had potential. Especially when things were at their most emotional, as we were going through the negotiation process with our offer, Jess was exactly the kind of professional advocate we needed. He got us the best price possible and negotiated to an accepted offer while keeping us from pulling out our hair or having a total emotional meltdown. If Jess is indicative of the quality of people at Buyers Brokers Only … you can't go wrong with this firm. Jess was extremely helpful and listened to our personal needs, incredibly respectful and that goes a long way with me. I will unquestionably recommend Jess to other friends, family looking for a trusted, reliable, and professional buyers agent. No one will work harder for you with you with your best interest solely in mind. Client: David & Keri M.
My wife and I recently worked with Jess Wagner buying a house in Belmont. Jess was great throughout the entire home buying process. He was there every step of the way. Being rookies, Jess took his time and explained every step in detail. I really think Jess likes to see his clients get the house they are looking for. He was always on time, courteous, and one step ahead of the paperwork. I cannot recommend him high enough. We bought our first home with Jess Wagner. He was on time and efficient throughout the process, which is a very valuable thing to have when home buying stress kicks in. He was personable and has plenty of experience which became clear as he gave us advice on houses we looked at and pointed out things we would not have thought about. He helped us through this crazy sellers market and amazingly helped us get our first home slightly under list price. We highly recommend Jess! Call Jess Wagner from Buyers Brokers Only, if you need a buyer broker to help find and purchase a home. Jess helped us identify what we were looking for in a house and showed us at least a dozen properties. Through everything Jess was very responsive and set up viewing appointments promptly, usually with viewings within 24 hours. With a low-quantity, high-turnover market such as Boston, time is everything. He answered all of our questions and some multiple times. He held our hands and guided us through the offer, P&S, inspections, and closing process -- remaining highly responsive through it all. Simply put, Jess was awesome. He is very knowledgable about the Middlesex real estate market and provides honest opinions. We will definitely be using his services again, if we decide to move.